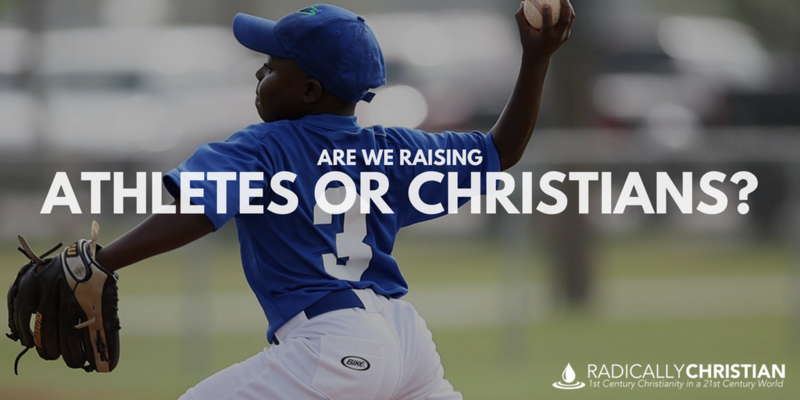 Are We Raising Athletes or Christians? If you know me and my family personally, you probably know my nine-year-old son loves baseball. He watches nearly every Texas Rangers’ game on television (or lies in bed listening to them on the radio), he pitches for his Little League team, he could sit and talk about baseball for hours on end, and it’s a rare occasion that he does not have some sort of ball in his hand (even in the house). But I strongly believe Christian families need to exercise caution when their children have athletic talent and passion. Are the gigantic stadiums we construct really very different from ancient temples? Aren’t professional athletes sort of like priests, who intercede with the sport on our behalf? Don’t Americans watch, listen to, and read about sports religiously? Doesn’t our favorite team playing seem to trump everything else in our lives? Isn’t our emotional state dependent on the performance of our team? Don’t many Americans believe sports make life worth living? I don’t want my son to idolize baseball. I don’t want him to think baseball makes life worth living. I don’t want him to believe he can’t be whole without baseball. I want him to know baseball could disappear overnight and everything would be just fine. Don’t get me wrong. I want him to play baseball and enjoy it as long as he wants to; but at the end of the day, I want him to remember that it is a game…not a god. When I was a kid, my mother used to tell me, “You can only have one priority.” There can only be one thing that’s most important in your life. There can only be one thing that takes precedence over everything else. As a father, I am determined that baseball will NOT be our family’s priority. Whoever loves father or mother more than me is not worthy of me, and whoever loves son or daughter more than me is not worthy of me. And whoever does not take his cross and follow me is not worthy of me. Whoever finds his life will lose it, and whoever loses his life for my sake will find it. If Jesus was talking to us today, wouldn’t He say, “Whoever loves baseball or soccer more than me is not worthy of me, and whoever loves football or basketball more than me is not worthy of me”? Jesus and His kingdom must be our priority. Everything else must be considered “rubbish” in comparison (Philippians 3:8). We are going to have to be incredibly intentional to spend far more time, money, and energy on the things of Jesus Christ than we do on sports. Children intuitively understand what is most important in your home. They pick up on the verbal, and non-verbal, cues about what takes precedence. They can tell if games and practices are more important to us than worship, Bible study, evangelism, and service to others. It isn’t just the sermons we preach with our mouths, but the sermons we preach with our wallets and our calendars.